Waiter, What’s This Maggot Doing in My Soup? As a boy growing up in rural Missouri, I was very interested in insects and ended up with a rather sizable collection of mounted specimens that I took to the local 4-H fair. Later, when I became a 4-H leader to a younger friend nearby, I passed on what I’d learned. I remember once, after running out of ideas, spicing things up with a snack of deep-fried insects. As I recall, we ate grasshoppers, bees, and possibly cicadas. Little did I know that I could have been on the brink of a future career. If you travel much outside the US and Europe, you run a good chance of running across insects served up as snacks or side dishes. But if people like China’s Li Jinsui have their way, edible insects will become a global main course. As reported in Le Monde, Li runs an “insect factory,” which has as its focus the housefly—in particular, the immature housefly, or maggot. You can read the entire article here, but if you need some coaxing, let me whet your appetite with some quotations. Where else can you read such phrases as this? Li says he can deliver about 150kg of maggots a day . . .
With the price of wasp larvae on the rise . . .
For Li, raising insects for human consumption isn’t just a novelty. He’s hoping to educate his countrymen, develop his business, and become “the industry’s world leader.” One obstacle that he has to overcome on the maggot front, though, is to figure out how to raise his flies on a diet of rice. That’s because housefly maggots typically feed on animal feces, which makes them unsuitable for human consumption. Sounds like Li has a lot of educating and persuading to do. If day-old deep-fried chickens had no bones, had hair instead of feathers, and were the size of a newborn sparrow, they might taste like tarantulas. § 7 Responses to Waiter, What’s This Maggot Doing in My Soup? Damn…. I’ve tried one little snackable here in Korea, “bondaegi” or silk-worm larvae. I prefer Doritos. Yeah, there are a lot of things I’ve tried, but don’t plan on going back for more. My guess is that I have some reasonable idea about who that younger 4-Her might have been. My guess is that you would be correct. I think I’m going to remember the phrase “accidental maggot.” I’m pretty sure I wouldn’t eat one of those. Thanks for sharing. 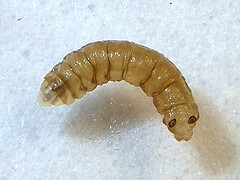 You are currently reading Waiter, What’s This Maggot Doing in My Soup? at Clearing Customs.